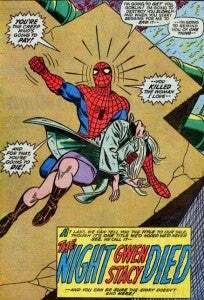 In a just-released excerpt from the upcoming book Marvel Comics: The Untold Story, legendary Amazing Spider-Man writer Gerry Conway had the unique ability to kick a character that he had already killed while she was down when discussing the decision to kill Peter Parker's girlfriend, Gwen Stacy, rather than his elderly Aunt May. “She was a nonentity, a pretty face. She brought nothing to the mix. It made no sense to me that Peter Parker would end up with a babe like that who had no problems," Conway is quoted as saying in the book. "Inevitable" is a word that we've heard associated with that storyline before recently--Emma Stone, who played the character in this summer's hit movie The Amazing Spider-Man, told reporters before the film was released that she thinks the death of her character is an essential part of Peter's mythology that can't be skipped over for the happy ending of a movie. Ironically, it's after her death that Gwen Stacy arguably got the most character development and become more important in the eyes of many fans. 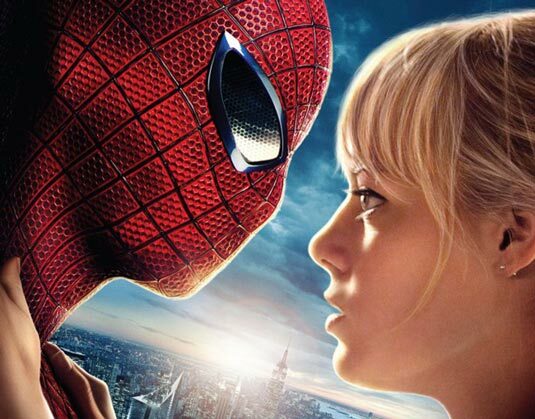 In Marvels, the classic miniseries by Kurt Busiek and Alex Ross, point-of-view character and Daily Bugle photographer Phil Sheldon encounters Gwen Stacy and is impressed by her; she's a whip-smart young girl who's dealt with a lot of tragey and met it head on, he thinks, and she very maturely has managed to keep herself from blaming Spider-Man for the death of her father, a police captain killed during one of Spidey's brawls with Dr. Octopus. What Gwen didn't know, of course, is that her boyfriend Peter was secretly Spider-Man, and that when a villain learned that, she could become a bargaining chip. When she's killed by the Green Goblin, it drives Sheldon to despair. Other stories written after the character's death haven't been as kind to Gwen, or as liked by fans. J. M. Straczynski's "Sins Past" story, one of the most notorious and controversial in his long run on The Amazing Spider-Man, included the revelation that Stacy had given birth to twins before her death--and that Norman Osborn, the supervillain who killed her, had been the father. At the time, Straczynski had wanted the father to be Peter, but editorial feared that it would make the character seem too old, as the children were adults by the time anyone became aware of them. That his high school girlfriend had adult children didn't seem to figure into their thinking. No matter; those characters will likely never appear again, following the massive One More Day retcon which has removed much of Peter's personal history from that period in an attempt to make him younger and more relatable. 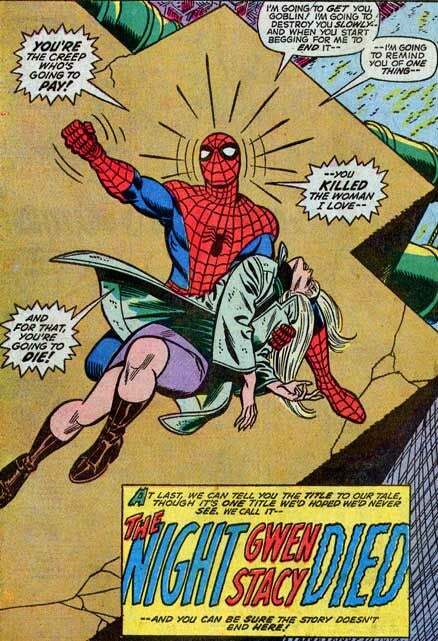 Her death is one of the most discussed panels in all of comics history, with certain prints of the story removing a sound effect that appears to suggest that it was Spider-Man's attempts to save her that actually delivered the killing blow, so to speak.